In any type of business, it is always good to conduct surveys to keep you informed. Surveys allow you to measure your growth and progress when it comes to hitting your targets and goals; it also allows you to know which areas or aspects you need to improve on. Thus, even a catering business needs to conduct an internal and external survey to assess progress and determine areas for changing and/or improvement. Knowing your customers’ feedback about the products and services you provide helps you know where you need to improve and what you need to prioritize. Thus, it is always good to conduct a customer satisfaction survey to customers who engage in a business transaction with you, that way you can easily gather the data to back up initiatives for improvement and progress. A satisfaction survey is a survey that allows you to assess if the services and products you have provided are worth the price a customer pays. It helps you gather data that will be the basis for a thorough overall assessment which will help you draft and/or conduct new plans. The survey will mostly ask the customer questions about the overall satisfaction he or she has felt during the time you have provided your catering services. A hospital has to cater quite a few number of patients in a day that’s why it is important to ensure that the food they provide their patients with are scrumptious and at the same time healthy. Thus, conducting weekly catering surveys will help the hospital caterer know what they can do to make their services better. 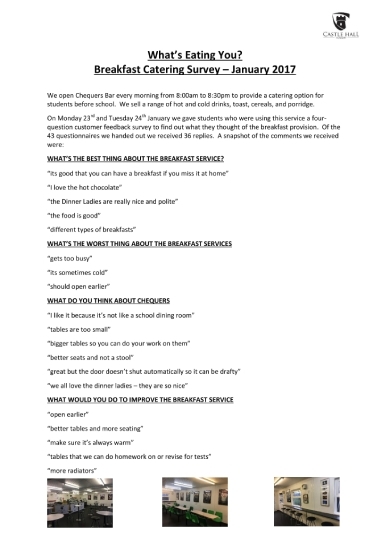 As you can see in this example, the survey asks easy but essential questions that will help them achieve better quality service. 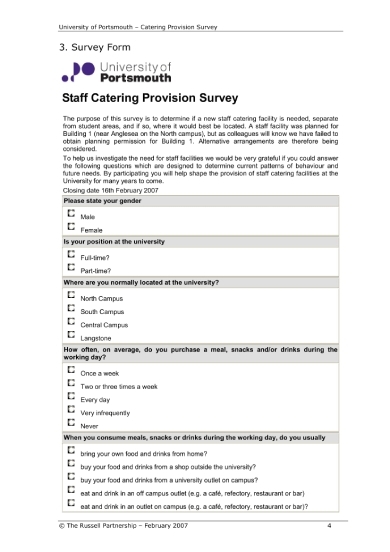 This catering survey was used to create a benchmark for all the caterers in the university. As an organization, you can gather data from your members to help you create a comparable index that will help the organization have a standard to refer to when it comes to providing services to the students, staff, and other visitors to campus. You can conduct this kind of survey to help your organization establish a clear standardized process. Gathering accurate data from your client is essential when you want to provide them with good-quality service. 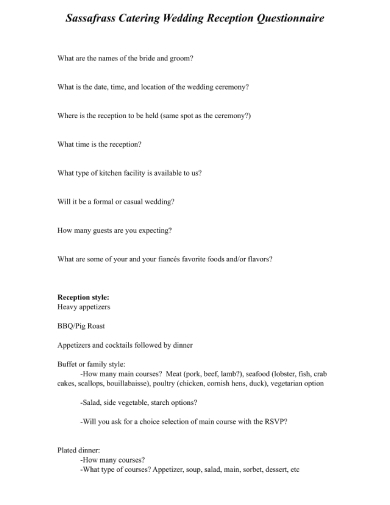 In this sense, having a survey questionnaire that asks all the essential information relevant to the catering booking will help you know what they specifically want from you. 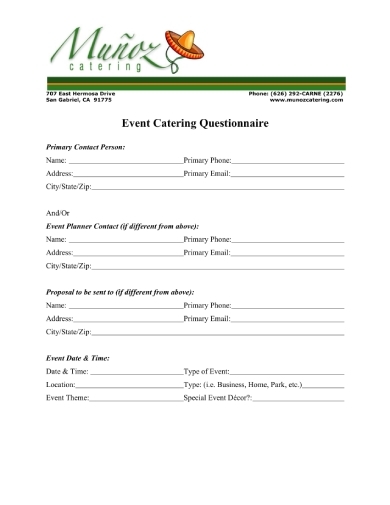 You can use this survey questionnaire example as a guide when you want to create a thorough questionnaire for your own catering business. In order to know if certain initiatives are necessary to make the overall process better and more efficient, you can conduct a survey to hear the voice and input of the majority. 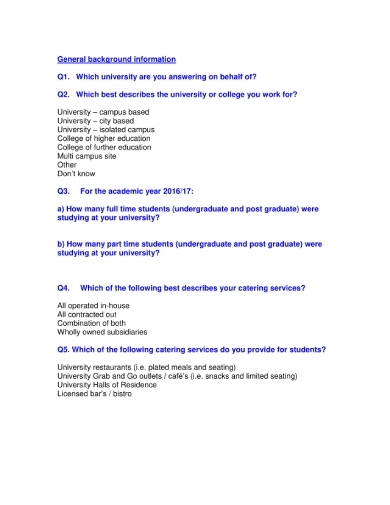 The goal of this survey example is to find out if there is a need for a new catering facility that is separate from the student areas within the university. Since a survey needs to be conducted within a balanced statistics, this will help in ensuring that accurate data is gathered. 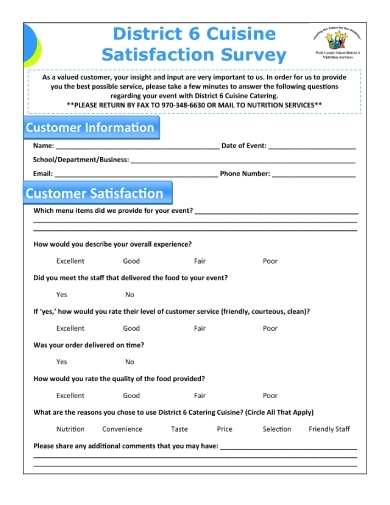 Conducting a customer feedback survey will surely help caterers know what they are doing right and what their customers want them to improve on. 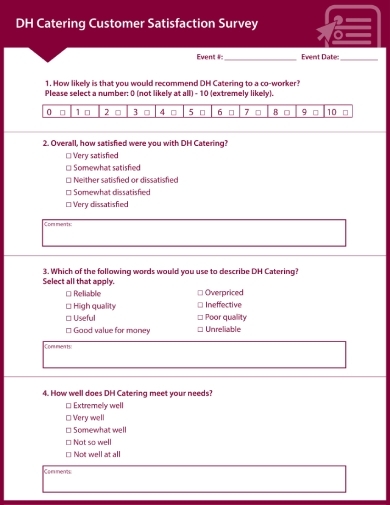 Furthermore, the survey will help the caterer become aware of how they provide their services and will be the basis for an unbiased assessment. Providing a survey summary to the stakeholders will also help them become aware of the situation so that plans for improvement can be made properly and carefully. 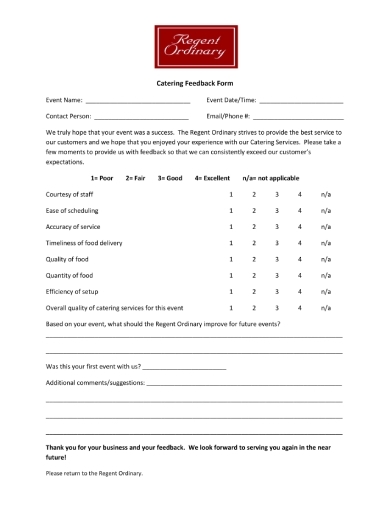 In order for a catering business, or any business for that matter, improve, a thorough feedback survey must be conducted. Thus, having a catering feedback survey form ready after a booking comes to an end will help you gather the information that you need in order to enhance your performance and services. In relation to this, you can download and use this survey example as your guide to creating a perfect survey form. Wedding receptions are quite tricky to cater; although the couple may book for only a certain number of people, the actual number that shows up either goes way overboard or fewer than expected. In any case, it is important to gather sufficient information from the couple with what they want for their reception to help them achieve their dream wedding. Having a survey questionnaire where the couple can write the specific details will help you provide the good-quality service that they expect. In the hotel industry, self-catering means booking a holiday or vacation home where you prepare and cook your own food with the provided equipment or means within the room. 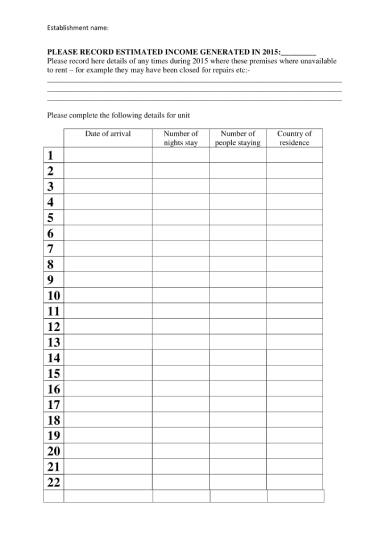 In this regard, this self-catering survey form was used to list down all the self-catering rooms or premises were booked on certain dates. This survey form helps in ensuring there is accountability with each accommodation to ensure proper maintenance, assistance, and services are provided. After a survey is conducted, it is important to present a tabulated output to the stakeholders that require to know the results. Having a comprehensive and thorough survey report will help people understand the premise as well as the results of the conducted survey. 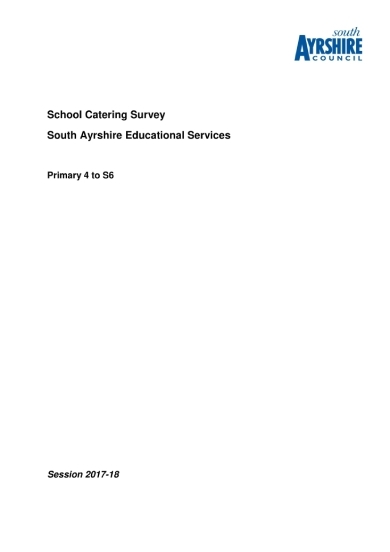 In this example, the report focuses on the data gathered from a school catering survey in the hopes of knowing what needs improvement and serve as a guide in generating new plans to help continue the progress.